The educator could read through the information provided in advance and generate a guide for students to use while viewing the interactive. 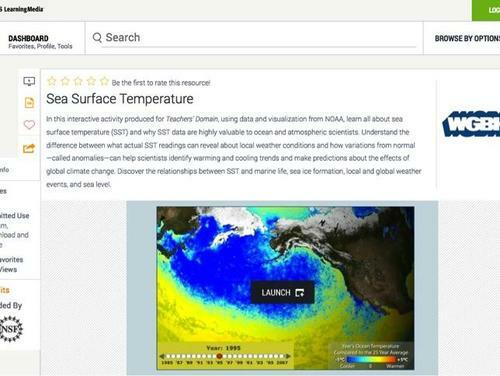 While this resource does discuss the data sources (NOAA), it does not provide detailed references. The resource includes short descriptions of where the data came from and what their implications are for marine biodiversity, sea ice, weather, El NiÃo, sea levels, the Arctic and climate change. Comments from expert scientist: Presents NOAA data. The visualizations are fun, and there are a variety of interesting facts on the website, but it doesn't quite add up to a real learning experience. The SST data are presented on a rather confusing Mercator projection, and appear to run only as a video. The anomaly data are presented on a different projection, where the user must step through the slides. The visualizations of the sea surface temperature (SST) data and SST Anomalies are state-of-the-art. These visualizations can be used to discuss major changes occurring on the ocean and their implications. The main resource page contains support materials (e.g., a background essay, discussion questions, standards) to stimulate student inquiry and further questions. The design of the display panels, tabs, navigation and links is excellent. The visualizations require a Flash plugin to run in a browser. The visualizations are not suitable for projection, which may hamper how they can be used in a classroom setting.